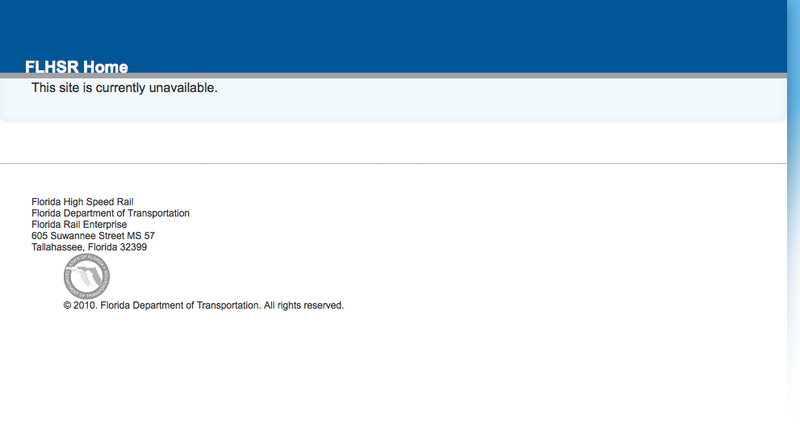 The home page of Florida's high-speed rail project as of Monday morning. As expected, U.S. Transportation Secretary Ray LaHood announced on Friday that the $2.4 billion rejected by Florida Gov. Rick Scott for a high-speed rail line between Tampa and Orlando will instead go to other high-speed rail projects in the U.S. Which ones? It’s unknown at this point — Secretary LaHood said projects will have to apply for the funds and they will be awarded as grants. California profited handsomely when Ohio and Wisconsin also rejected federal funds for high-speed rail. Tampa and Orlando are only 84 miles apart, generally considered too close for high-speed rail to make sense. The train trip, with many stops along the way, would have shaved only around a half-hour off the drive. Since there are no commercial flights between the two cities, the new line would not have lured away fliers or freed up landing slots at the busy airports. And neither Tampa nor Orlando has many public transportation options. So the question arose: Could riders be persuaded to leave their cars behind and buy tickets to places where they would still probably need cars?